Park(ing) day photo by iomarch; Flickr Creative Commons license. More on Park(ing) Day later in the article. “Tactical Urbanism” is one of the latest widely-used buzz words in the community building industry. It generates excitement and enthusiasm from activists, but concern and disdain from some municipal officials. Can some tactical urbanism take on the form of selfish vandalism or can it reflect a powerful form of community-supportive activism? A new temporary use for a vacant lot, such as a pop-up dog park or bocce ball court. A one day reuse of metered parking spaces for a mini-park, outdoor seating, or sidewalk café. 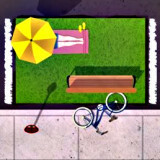 Construction and placement of outdoor seating in public spaces that lack places to sit. 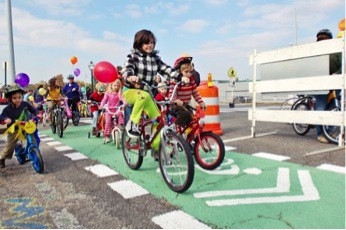 Conversion of underutilized roadway pavement to public plazas or bike lanes. Occupation of temporary pop-up retail shops in previously vacant storefronts. 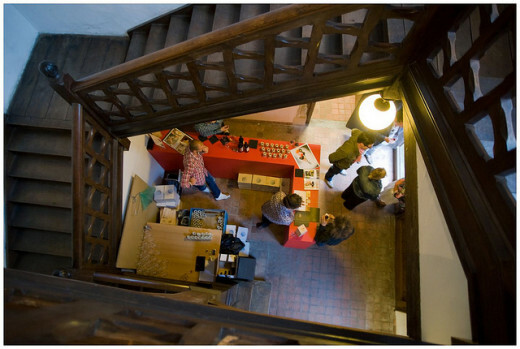 A pop-up store in Belgium. Photo by Mark Florquin; Flickr Creative Commons license. The concept of tactical urbanism has been around for several years under the terms “guerrilla urbanism,” “city repair,” or “do-it-yourself “DIY” Urbanism. 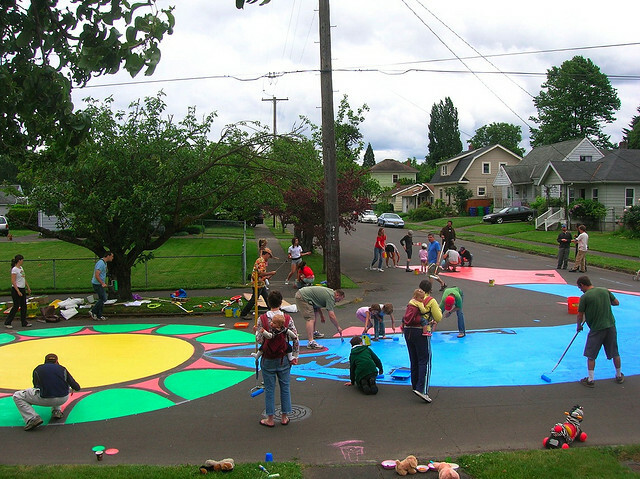 Painting an intersection in a Portland, Oregon neighborhood. Photo by City Repair; Flickr creative commons. The results are typically a series of small-scale interventions that alter the public realm, making it (at least to its advocates) more user-friendly for the public. Lydon refers to the interventions or tactics as "short-term actions that were demonstratively leading to long-term change." Examples best used to describe these interventions include: PARK[ing] day, chair-bombing, pavement to plazas, guerilla gardening, and pop-up shops. 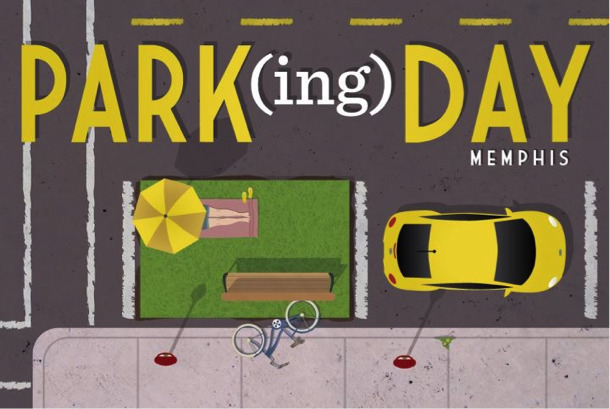 PARK(ing) Day is an initiative where citizens and activists collaborate to creatively transform metered parking spaces into temporary public places. 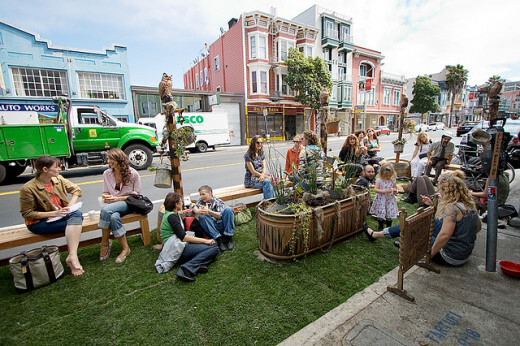 The concept was originally conceived in 2005 when a San Francisco firm, Rebar, converted a single metered parking space into a temporary public park in an area that was underserved by public open space (see video below). A promotional poster for PARK(ing) Day Memphis 2013. Source: Memphis PARK(ing) Day Collaborative. Rebar decided to promote the initiative as an “open-source” project by creating a how-to manual to empower people to create their own parks. 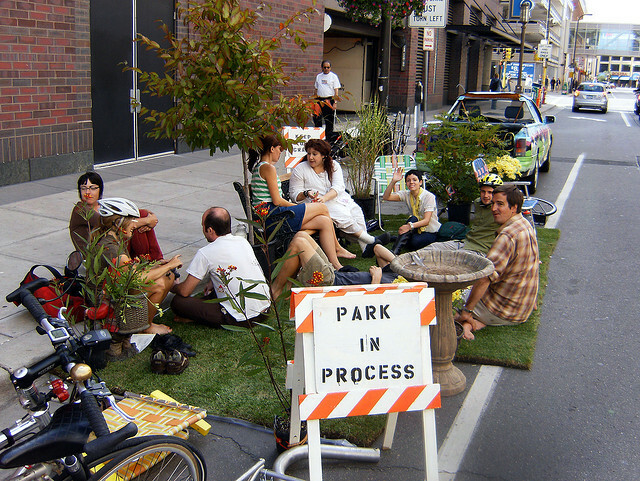 PARK(ing) Day has since grown into an international event in hundreds of cities on the third Friday of each September. Park(ing) Day photo in Minneapolis, by SV Johnson (Flickr Creative Commons license). To view dozens of Park(ing) Day photos from around the country, go to Flickr.com and search for: Parking Day. Below is a six minute video by StreetFilms of Rebar's 2006 Parking Day in San Francisco. Chair-bombing is another tactic that creates and installs seating in a public space where places to sit are desirable but lacking. This rather simple gesture goes beyond offering a seat to others, it has been used to recycle disposed materials, generate social activity, as well as define key locations where additional public improvements should be made by municipal officials. 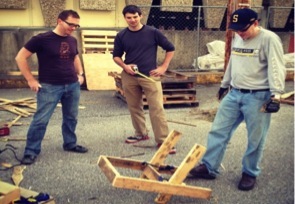 Repurposing pallets to construct public seating for the Crosstown MemFix event. Source: Memphis Mayor’s Innovation Delivery Team. DoTank boasts that chair-bombing has been replicated beyond New York to cities such as Philadelphia, Dallas, and Memphis. Pavement to Plazas conversions “reclaim” oversized streets that are underutilized and lacking in public space. Lydon explains that these interventions typically start by using temporary, inexpensive materials to re-assign excessive vehicle space on key streets for use by pedestrians or bicyclists. Interestingly, most examples of pavement to plazas initiatives have been led by city officials and departments, however sometimes a groundswell of neighborhood activists take the lead. This was the case in the Broad Avenue neighborhood in Memphis, Tennessee. City officials, after some hesitation, cooperated with neighborhood tacticians by putting a “New Face on Old Broad” 5 in Memphis’ Binghamton neighborhood. This community-led initiative redesigned Broad Avenue and painted new bike lanes, crosswalks, and head-in parking spaces. The new installation was tested and launched in a public neighborhood celebration. Neighborhoods and cities are complex, there are no silver “redevelopment” bullets. Government is not oriented to deliver neighborhood level solutions. Creative placemaking is a key component of economic development. Low-risk projects that have the potential for high-return. Prototyping ideas to gauge neighborhood readiness for capital investment. The excitement from a “New Face on Old Broad,” led to the attraction of 25 new businesses reclaiming 17 previously blighted properties -- and six public art installations. As for the temporary street redesign, it later was approved and adopted by the city’s traffic engineering and remains intact today. In some communities, municipal officials have gone on record (at least initially) as staunch opponents to tactical urbanism. For example, a series of tactical urbanist interventions in Hamilton, Ontario raised strong objections by city officials, pitting the public works director against local activists. Tactical urbanism highlights the tricky tension that exists between the role of public officials and community activists interested in improving the public realm. Tactical urbanism highlights the tricky tension that exists between the role of public officials and community activists interested in improving the public realm. Stories of continued success of urban interventions, combined with a lack of actions on public improvements by city officials, will encourage more guerrilla urbanists take these matters into their own hands. Will tactical urbanism evolve as a productive, collective movement or will rogue interventions prove to be a series of self-interested exploits? This brand of activism refuses to be ignored. It provides a role for citizens in community revitalization, which has the potential to change our cities for the better. Better communication between municipal officials and community activists can forge new public-private partnerships to leverage this movement to the benefit of our communities. 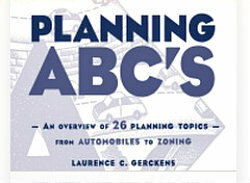 Editor's note: Interested in learning more about tactical urbanism? 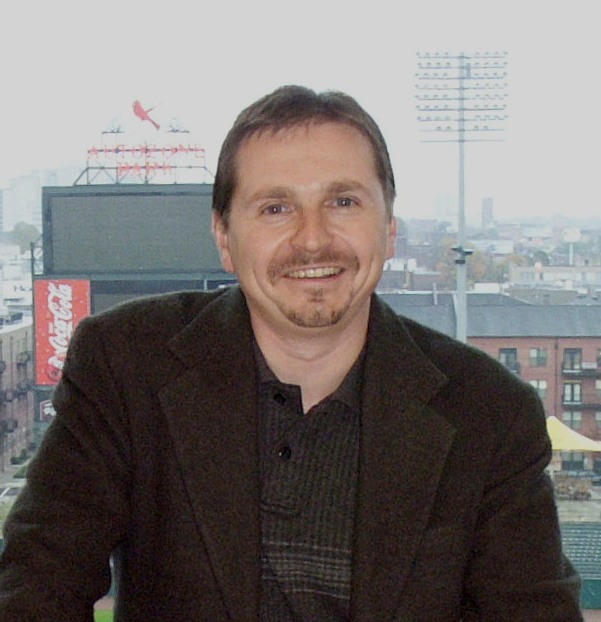 Take a look at this short (11 minute) video of a talk by Mike Lydon at the Congress of New Urbanism national conference in Salt Lake City in March 2013.